Frank Barat poses questions from artists, activists and journalists, on Egypt, corporate power, Palestine and more. 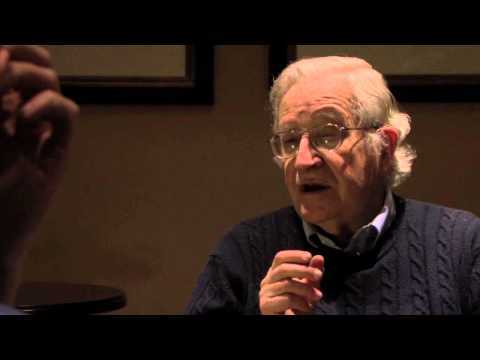 For his second interview in less than a year with Professor Noam Chomsky (the first one took place in Cambridge in September 2010 and is available here), Frank Barat asked well known artists and journalists to each send one question that they’d like to ask Noam. Political practice often surprises political vocabulary. For example, the recent revolution in the Middle East is said to demand democracy. Can we find more adequate words? Isn’t the use of the old and frequently betrayed words a way of absorbing the shock, instead of welcoming it and transmitting it further? Just to begin I think the word revolution is a bit of an exaggeration. Maybe it will turn into a revolution but for the moment it’s a call for a moderate reform. There are elements in it, like the workers movement that have tried to move beyond that but that remains to be seen. However, the point is correct but there is no way out of that. It’s not the just the word democracy, it’s every word that is involved in discussion of political affairs. It has two meanings. It has its literal meaning and it has the meaning that’s assigned to it for political welfare, for ideology, for doctrine. So either we stop talking or we try to use the words in a sensible way. And it’s not just about democracy. Take a simple word like ‘person’. It sounds simple. Take a look at it. The United States is quite interesting. The United States has guarantees of personal rights that go beyond maybe any other country. But have a look at them. The amendments of the constitution states very explicitly that no person can be deprived of rights without due process of law. It reappears in the 14th amendment – it was in the 5th amendment, it was intended to apply to freed slaves but it’s never been applied to them. The courts narrowed the meaning and broadened the meaning crucially. They broadened the meaning to include corporations: fictitious legal entities established by a state power. So they were given the rights of persons, by now rights way beyond persons. On the other hand, it was also narrowed because the term ‘person’, you might think, would also apply to those creatures walking around doing the dirty work in the society, who don’t happen to have documents. And that wouldn’t do, because they must be deprived of rights. So the courts, in their wisdom, decided they’re not persons. The only persons are people with citizenship. So now non-human corporate entities like the Barclays Bank, they are persons, with rights way beyond persons. But humans, the people sweeping the streets, are not persons, they don’t have rights and the same is true to every term you look at. So take ‘free trade agreements’. For example there’s a North American Free Trade Agreement: Canada, the United States and Mexico. The only accurate term in that is ‘North American’. It’s certainly not an ‘agreement’, at least if human beings are part of their societies, because the populations of the three countries were against it. So it’s not an agreement. It’s not about ‘free trade’, it’s highly protectionist, tremendous protections for monopoly pricing rights for pharmaceutical corporations and so on. A lot of it is not about trade at all. In fact, what we call ‘trade’ is a kind of a joke. For example in the old Soviet Union, if parts were manufactured in Leningrad and shipped to Warsaw for assembly and then sold in Moscow, I wouldn’t call that trade, although it did cross national borders. It was interactions within a single-command economy. And exactly the same is true if General Motors manufactures parts in Indiana, sends them to Mexico for assembly and sells them in Los Angeles. We call that trade both ways. In fact if you look at the trade, it’s about 50% of it. That’s small. And a lot of the agreement is just about investor rights: granting General Motors the rights of national companies in Mexico for example, which Mexicans of course don’t get in the United States. Pick the term you want. You are going to find exactly the same thing. So yes, that’s a problem and we get around it by trying to be clear about the way we use the wrong terminology. I may understand his feelings and share them, but I don’t know what the loss was. When was it ever true? At no time that I can remember, the term intellectual came into pretty common use in its general modern sense at the time of the Dreyfusards. They were a small minority. A small vilified minority. The mass of intellectuals supported state power. During the first world war, and shortly afterwards, the intellectuals in every one of the countries, passionately supported their own state and its own violence. There were a handful of exceptions like Bertrand Russell in England or Rosa Luxembourg and Karl Liebknecht in Germany or Eugene Debs in the United States, but they were all in jail. They were marginal and they were all in prison. In the John Dewey circle, the liberal intellectuals in the United States who were passionately pro-war, there was one member, Randolph Warren, who did not go along with it. He was not put in jail – the United States is a pretty free country, but he was just thrown out the journals, intellectually exiled and son on. That is the way it has always been. During the 60s, a big activist period, take a careful look: intellectuals were very supportive of Martin Luther King and the civil rights movement, as long as he was attacking somebody else. As long as the civil rights movement was going after racists sheriffs in Alabama, that was wonderful. Everybody praised it. As soon as it turned to class issues, it was marginalised and suppressed. People tend to forget that he was killed when he was taking part in a sanitation workers strike, and on his way to Washington to help organise the poor people’s movement. Well that crosses a boundary, that goes after us. It goes after privilege and the north and so on. So the intellectuals disappeared. With regard to the Vietnam war, it is exactly the same thing. There was almost no-one, among known intellectuals – there were of course people on the fringes, they were young people and so on- but among well-known intellectuals, practically nothing. At the very end, after the Tet offensive in 1968, when the business community turned against the war, then you started getting people saying ‘Yes, I was always a long time anti-war activist’ … but there’s no trace of it or whatever. In fact you can take this back to the earliest history. Go back to classical Greece, who drank the hemlock? The guy was accused of corrupting the youth of Athens, with false gods. Take biblical records. They don’t have the term ‘intellectual’ but they have a term which meant what we mean by intellectual, it is called ‘prophet’. It is a bad translation of an obscure Hebrew word. There were so-called prophets, intellectuals, who carried out political criticism, condemned the king for bringing about disaster, condemned the king’s crimes, called for mercy for widows and orphans, and so on… Well we would call these intellectuals. How were they treated? They were denounced as haters of Israel. That is the exact phrase that was used. That is the origin of the phrase ‘self hating Jew’ in the modern period. And they were imprisoned, driven into the desert and so on. Now, they were intellectuals who were praised: the flatterers of the court. Centuries later, they were called ‘false prophets’. But not at the time. At that is almost the entire history since. There are a few exceptions. In the modern period, the one major exception I know is actually Turkey. It is the only country I know where leading prominent artists, academics, journalists, publishers – a very broad range of intellectuals – not only condemn the crimes of the state, but are involved in constant civil disobedience against it. Facing, often enduring, pretty severe punishment. I have to laugh when I come to Europe and hear people complaining about how the Turks are not civilised enough to join their advanced society. They can learn some lessons from Turkey. And that is pretty unusual. In fact it is so unusual that it is barely known, you can’t bring it up. But aside from the word ‘loss’, I think Chris Hedges’ comments are accurate, but I just can’t perceive any loss. I think it is about the same that it has always been. And in fact, the way that the these intellectuals are treated, of course does vary. So in the United States lets say, maybe they are vilified or something, in the old Soviet Union, lets say in Czechoslovakia in the sixties and seventies, they could be imprisoned, like Havel was imprisoned. If you were in American domains at that time, like El Salvador, you’d get your brains blown out by elite battalion trained and the US special warfare school. So yes, people are treated differently depending on the country. Have the uprisings in the Arab states made you change, revise some of your past evaluations? Have they – and how – affected your notions of, for example :masses, hope, facebook, poverty, western intervention, surprise? Actually, Amira and I met in Turkey a couple of month ago, we had a couple of hours, a chance to talk and neither of us, and maybe she did but if she did, it was a secret, I certainly didn’t anticipate anything, there was nothing happening in the Arab world, so yes, it changed my opinion in that respect that it was unexpected. On the other hand, when you look back at it, it’s not that different from what’s happened before, except that in the past, the uprisings were brutally suppressed and indeed they were this time too so the first of the uprisings was actually in November and that was in the Western Sahara, which is occupied by Morocco, 25 years ago Morocco invaded, violated UN resolutions, it is a brutal occupation. In November, there was a non-violent protest in which Moroccan troops came in and crushed it violently which is something they’ve been doing for 25 years, it was serious enough so it was brought to the UN for a potential enquiry but France intervened. France is the primary protector of atrocities and crimes in Western Africa, it is the old French possessions, so they blocked the UN enquiry, that was the first. The next one was in Tunisia, again more or less a French area, but that one was successful, it threw out the dictator. And then came Egypt which is the most important because of its significance in the Arab world and that was pretty remarkable, a remarkable display of courage, dedication and commitment. It did succeed in getting rid of the dictator, it hasn’t yet changed the regime. Maybe it will but the regime is pretty much in place, different names, but it is nothing new, that uprising, the January 25 uprising that was led by young people who called themselves the April 6 movement. Well the April 6 happens for a reason, they picked that name because it was the date of a major strike action a couple of years earlier at the Mahalla textile complex, the industrial complex, it was supposed to be a major strike, support activities and so on. Well they were crushed by violence, that’s April 6 and that is only one of the series. Incidentally, shortly after the crushing of the April 6 uprising, President Obama came to Egypt to deliver his famous address, the outreach to the Muslim world and so on. He was asked at a press conference whether he would say anything about the authoritarian government of President Mubarak and he said no he wouldn’t, he said Mubarak is a good man, he is doing good things, keeping stability like crushing the April 6 strike and so on and that is just fine. The most striking one is Bahrain. That is frightening to the West, first of all because Bahrain hosts the US fifth fleet, a major military force in the region. Second because it is largely Shia and it is right across a causeway of eastern Saudi Arabia which is majority Shia and happens to be where most of the oil is. For years Western planners have been concerned about the kind of geographical and historical accidents, most of the world’s oil is in the Shia areas, right around that part of the Gulf, Iran, southern Iraq, eastern Saudi Arabia. Well if the uprising of Bahrain spreads to Saudi Arabia, then Western power is really in trouble and in fact Obama has changed the rhetoric that he used officially to talk about the uprisings. For a while it was regime change, now it is regime alteration. We don’t want it to change, it is too valuable to have a dictator to run things. Actually a rather striking fact about all of this is that, take a look at the wikileaks exposures, it’s pretty interesting. The ones that got the most exposure in the West, the big headlines, the leaks from the ambassadors which said that the Arab world support us against Iran, well one thing was missing in that reaction, in the newspapers by the columnist others, namely Arab opinion, what they meant was that the Arab dictators support us but what about Arab opinion? There is none, it’s not reported. In the United States zero, I think there is one report in England, Jonathan Steele reported it, probably nothing in France, I don’t know. But it is well known, released by very prestigious agencies – it turns out that some Arabs think that Iran is a threat, about 10 per cent. The majority, the vast majority, think that the major threat is the United States and Israel. In Egypt, 90 percent say that the United States is the major threat, in fact US policy is so strong that in Egypt I think it is close to 80 percent that think that the regime would be better off if Iran had nuclear weapons. Over the all region, it is the majority. Coming back to John Berger and term democracy, Western intellectuals’ comptent for democracy is so profound and deep seated, that it doesn’t even occur to anyone to ask what the Arabs think, when we are euphoric that the Arabs support us, the answer is it doesn’t matter, as long as they are quiet and subdued and controlled, as long as there is what’s called stability, it doesn’t matter what they think. The dictators support us period, we’re euphoric, well that kind of ties together a number of these questions but going back to Amira Hass’ comment, what has happened, does, should, lead us to think about what has been happening, not only in the Arab world but elsewhere, has often a reason and has been subdued by violence and that has been true for century. I mean the British were suppressing the democracy movement in Iran over a century ago. In Iraq there was a Shia uprising, and as soon as the British cobbled the country together, after the first world war, big uprisings violently suppressed one of the first uses of aircraft to attack civilians. Lloyd George wrote in his diary that this was a great thing because we have to reserve the right to bomb ‘niggers’. It continued in 1953 whenthe United States and Britain combined to throw out the parliamentary government in Iran. In 1936 to 1939, there was an Arab uprising in Palestine against the British, violently crushed. The first Intifada was again a very significant popular uprising It was entirely non-violent and a real popular movement: women’s groups protest against the feudal structure, trying to dismantle it and so on. It was crushed by violence. So sure these things like this happen a lot of time, they’re just crushed. What is unusual this time is that it’s strong enough, in most of the countries able to sustain itself. What will happen in Saudi Arabia and Bahrain during, we don’t know. In fact we really don’t know what will happen in Egypt. The military has so far retained control and the top military command at least, is deeply embedded into the old oppressive regime. They own a lot of the economy, they were the beneficiaries of the Mubarak’s dictatorship, they are not going to give it up easily, so it remains to be seen what happens there. How do we overcome sectarianism on the left? I don’t think we will ever overcome it. For one thing one form of sectarianism should be welcomed, namely disagreement. A lot of things are quite unclear, we ought to have discussion and disagreement, pursue different options and so on, but what he means by sectarianism and what is generally meant by it, is initiatives that sometimes attempt to, and often succeed, in breaking up popular movements. Individuals or political groups that have their own agenda and want to take control, become little Lenins and so on. That kind of sectarianism I don’t think is ever going to be suppressed. It can be marginalised, so for example during the uprisings in the Arab world, say Egypt, Tahrir Square, there was surprisingly little sectarianism and there were many different points of view, you know, but there was a unity and common goal. That is beginning to fall apart unfortunately. So just yesterday, there was a women’s demonstration calling for women’s rights. It was attacked. It’s a very sexist society and the women were attacked. OK, that’s sectarianism. There is now also religious sectarianism developing I mean, when a common goal is no longer sort of uniting people in a struggle then you do get sectarianism. That’s the way to bring people together. For example in the labour movement, say in the United States. Labour has often been extremely racist, not necessarily just against blacks, for example Irish in the late nineteen century were treated very much like blacks. I mean you could walk around Boston and see signs ‘No dogs or Irish allowed’ and so on. We were called Huns, that means anybody from Eastern Europe, bitter racism against the Huns, against the Italians, it goes all the way back. But when the strike waves began in the late nineteenth century, and they really became significant, in places like the coal and steel centres in western Pennsylvania where people took over cities and ran them. At that point the sectarianism disappeared, the racism disappeared, there was unity, to achieve something. The same is true with CIO organising in the 1930s, it overcame racism against blacks and they worked together. That’s the only way to do it that I know. Same happened in the civil rights movement. If you’ve got a common goal and you can combine and try to achieve it, then sectarian efforts are marginalised, they don’t disappear, there’s still people hanging around the periphery and maybe if the motives and commitment decline they may begin to take over as we are beginning to see in Egypt, but I don’t know any other way to do it. Certainly I can imagine it and in fact there has been successful experiments with it, some of them right now. None of them utopian, none of them that I or you or others will aspire to but there are not insignificant. Take say the Mondragon system in Spain, it’s not workers managed, but it is workers owned. It’s a form of cooperative, quite successful, very broad. If you look around the United States, there are probably hundreds of self managed enterprises, not huge, some of them are pretty large, but they are successful. Take say Egypt right now, one of the interesting thing that is happening in Egypt is that the labour movement, which has been really militant for years (as I mentioned this is not an uprising out of nothing), in some of the industrial centres like the Mahalla, apparently workers have taken over the enterprise and have been managing it themselves. Well if that’s true, that would be the beginning of a revolution, to go back to Berger’s words. So yes it’s certainly feasible. The comment about inequality is very real. I don’t know the detailed statistics for the other countries but in the US right now inequality is back to the highest level it’s been in history, in the 1920s But that’s misleading, because inequality in the US is highly concentrated, it is mostly in the top one per cent of the population. Take a look at the income distribution, it goes very sharply up towards the high end and literally one tenth of one per cent of the population. Now that’s extraordinary wealth. In fact that’s driving the inequality, if you take that part away, it’s unequal but not totally out of sight. Who are they? They are hedge funds managers, CEOs, bankers and so on. Well something quite significant has been happening. Since the 1970s the economy has changed significantly, it’s been financialised. Go back to say 1970, financial institutions, banks, investment firms were a small percentage of corporate profits. Now, in 2007 for example, they reached 40%. They don’t benefit the economy, in fact they probably harm the economy, there is no social utility to them, but they are powerful. With economic power comes political power. Pretty obvious reasons. So they have gained extensive political power, for example those financial institutions that have put Obama into office pretty much, that’s where most of his funding came from. With political power comes the opportunity to modify the legislative system and they have been doing it. So since the 1980s mainly, fiscal policies have been changed, tax policies, to ensure very high concentration of wealth. Rules of corporate governance have been changed. They allow for example the CEO of a corporation to select the board that determines his salary. Well you can imagine what the consequences of that are. Actually you read them in the front pages of newspapers every day, about the huge bonuses given to management, that’s where that comes from. The regulation has collapsed, with very striking effects. This generalises to the rest of the world. I am talking about the US because I know it better. New Deal regulation prevented any financial crisis up until the 1980s, really. Since the 1980s, crisis after crisis, several during the Reagan years, pretty serious ones, in fact Reagan left office with the worst financial crisis since the depression. The Savings & Loans scandal, then came Clinton, then this housing crisis, eight trillion dollars of fake money disappeared, devastating the economy. Well all of these are political decisions. Meanwhile the cost of campaigning went way up and that compelled the parties to climb pretty deep into the pockets of corporate sectors where the money is. The next election, in 2012, is expected to cost about 2 billion dollars. Take a look at the Obama administration, and you notice, he is staffing the government right with executives. They are the ones who have the access to corporate funding that is going to buy the elections. Elections that are just becoming farces, run by public relations industry. Its a marketing effort, they are saying it quite openly. In fact Obama won the award from the advertising industry for the best marketing campaign of 2008, they know exactly what’s going on. Well all of this is a kind of a vicious cycle. It increases concentration of wealth, it increases political power, which acts to further increase wealth. Why is there no reaction? Actually there is a reaction, right now, for the first time, what’s going on in Wisconsin, is a very significant reaction. There is tens of thousands of people in the streets, day after day, with a lot of popular support, maybe two thirds of the population supporting them. They are trying to defend labour rights, the right of collective bargaining, which is under attack. I mean the business world understands very well that the one barrier to this total corporate tirany is the organised workers movement. So that’s got to be destroyed. Labour history in the US has been extremely violent, more so than in Europe and there have been efforts after efforts to wipe out the unions, but they keep reviving. Now there is a major one going on, but it’s been resisted. It’s been resisted by large popular movements. But where is the left? Actually what’s happened to the left is interesting. Since the 1960s when there was a big revival, there is quite an activist left. There are more young activists now than there were in the 1960s. But the issues have changed. The issues are called sometimes post materialist. They are important issues, I don’t denigrate them. Gay rights, environmental rights, women’s rights, they are all important things but they don’t reach to the concern of the people who are living under depression-level unemployment. They don’t reach to 20 per cent of the population who needs food stamps. There has not been that kind of outreach and organising. So when the protest started in Wisconsin a couple of weeks ago, there was practically no left initiative. I mean a couple of well known figures came to give talks, but it was not organised by the left groups who ought to be right at the heart of it. It’s there and it’d better come or else we are in bad trouble. While left activism is significant, very significant, it’s pretty much divorced from the daily struggle for survival and decent life of most of the population and that’s a gap that has to be overcome somehow. It’s an interesting question. She is a wonderful woman, she does fine work, she’s really committed to the Palestinian cause but the question tells you something about the recent Palestine solidarity movement. I mean, if I had asked her, let’s say, ‘why do you think it is absurd to try to advocate for civil rights for blacks in the United States?’ she’d be nonplussed – she’s devoted a lot of her life to that. In fact the only possible response would be: What planet are you coming from? That’s what I’ve been doing all my life. It’s exactly the same here. It’s now about 70 years that we have been advocating for what in the recent reincarnation is called the One State settlement. One State settlement, notice, not solution. A one state settlement, used to be called the bi-national settlement and if you think about it, yes, it’ll have to be a bi-national settlement. So that’s what I was doing when I was a young activist in the 1940s, opposed to a Jewish state. That’s continued without a break. And it’s kind of hard to miss. Since the late 1960s, a series of books, huge number of articles, constant talks all the time, thousands of them, interviews, all the same. Trying to work for a bi-national settlement, in opposition to a Jewish state. I’ve done a ton of work on this, activist work, writing and so on. But it’s not just a slogan, and I think that’s why somebody like Alice Walker does not know it. It’s not just a slogan, ‘let’s all live together happily’. It’s trying to look at the problem seriously. If you’re serious about it, you ask ‘how do we get there?’. You ask what are the steps that will take us there, not just would it be nice if we had peace? That’s easy. How do we get there? Well that depends on circumstances, like all tactical choices. So in the pre-1948 period, this was straightforward, we do not want a Jewish state, let’s have a bi-national state. From 1948 to 1967 you could not sensibly pick that position, you were talking to yourself. 1967 it opened up again. There was an opportunity in 1967 to move towards some kind of a federal system which could then proceed further to closer integration, maybe become a true bi-national secular state. In 1975 Palestinian nationalism crystallised and appeared on the agenda, and the PLO, turned to a two state settlement, the huge overwhelming international consensus at that time for a two state settlement in the form that everyone knows. From 1967 to 1975 it was possible to advocate for it directly and it was anathema, hated, denounced, because it was threatening. It was threatening because it could be fulfilled and that would harm policy formation. So if it was noticed at all, it was denounced, vilified. From 1975 on you could still maintain this position but you have to face reality, it is going to have to be achieved in stages. There is only one proposal that I have ever heard, other than let’s all live in peace together, the one proposal that I know is, begin with the international consensus, the two states settlement. It will reduce the level of violence, the cycle of violence, it will open up possibilities for a closer interaction, which already to some extent takes place, even in today’s circumstances, commercial, cultural and other forms of interaction. That could lead to erosion of boundaries. That could move on to closer integration, and maybe something like the old concept of bi-national state. Now, I call it a settlement because I don’t think this is the end of the road. I don’t see any particular reason to worship imperialist boundaries. So when my wife and I go back to when we were students, we were backpacking in northern Israel and happened to cross into Lebanon, because there is no marked border, you know, somebody finally yelled at us and told us to get back. Why should there be a border there? It was imposed by British and French violence. You should move towards closer integration to the whole region, a no state settlement if you want the word. There is plenty of things wrong with states anyway, why should we worship state structures? They should be eroded. Now, it’s a series of steps. If someone can think of another way to get there, then they ought to tell us. We could listen to it and talk about it. But I don’t know of any other way. So what you end up with, at least, what I end up with, what I’ve been writing and speaking about, is something that is too complex to put on a twitter message. In this age that means it does not exist. You have to support both the two states and the one state settlement. You have to support both of them, because one of them is the path to getting into the other. If you don’t make the first move, you’re not going to get anywhere. Now Alice Walker says that Israel won’t accept a two states settlement. She is right. It’s not going to accept the one state settlement either. So if that argument has any force, her proposal is out of the window, mine too. By the same argument you can show that there can never be an end to apartheid. White nationalists would never accept an end to apartheid, which was true – OK therefore let’s give up the anti-apartheid struggle. Indonesia will never give up East Timor, in fact the generals said so this loudly, ‘it’s our province, we’re going to keep it’. That would have been true if actions were taken in a vacuum But there are not taken in a vacuum, there are other factors involved. One factor, which is significant and in fact in these cases is decisive, is US policy. Well, that’s not engraved in stone. When US policy shifted on Indonesia and East Timor, it literally took one phrase from President Clinton to get the Indonesian generals out. At one point he said ‘it’s over’. They withdrew. In the case of apartheid, it’s a little more complicated. Cuba played a big role. Cuba drove South Africans out of Namibia for example, protected Angola. That had a big impact. But it was when the US changed policy, around 1990, there was a change of policy, it was at that point that apartheid collapsed. Now in the case of Israel, the US is decisive. Israel can’t do anything except what the US supports. It gives diplomatic, military, economic, ideological support. If that prop is pulled out, they do what the US says. In fact that’s happened over and over. So yes it’s true that if they were acting in a vacuum they’d never accept anything but what they are now doing. Taking over Gaza prison, taking over as much as the territories as you want, you know, they’ll continue. But they are not acting in a vacuum. There are things we can do, like in other cases, to change it. And in that case, I think you can consider, and even lay out a plan, for a move towards a one state settlement as a step towards something even better, you can go on. As far as I can see the only way to do that is by supporting the international consensus, as a first step. A step, a prelude to further steps. That means very concrete actions. We don’t have to have a seminar in which we discuss abstract possibilities. There are very concrete moves that can be made. For example, withdraw the Israeli army from the West Bank. That’s a concrete proposal and there are steps that can be taken to implement it. For example, Amnesty International, which is hardly a revolutionary organisation, has called for an arms embargo on Israel. Well ii the US and Britain, France, others, if the public could compel the governments to accept that proposal, and say there is an arms embargo unless you pull your army out of the West Bank, that would have an effect. Other actions can to. If the army pulled out of the West Bank, the settlers will go with them. They will climb into the lorries provided to them and move from their subsidised homes in the West Bank to their subsidised homes in Israel. Just like they did in Gaza when they got the order. Some will probably remain, but that’s OK, they want to remain in a Palestinian state, that’s their business. So there are quite concrete things that can be done. I mean, it’s not going to be like snapping your fingers, but it’s not beyond the kind of things that have happened elsewhere, when policy of the great powers changed, primarily the US. Frank Barat is coordinator or the Russell Tribunal on Palestine. Gaza in Crisis: Reflections on Israel’s War Against the Palestinians by Noam Chomsky and Ilan Pappé, edited by Frank Barat, is out now. Great interview. It clears a lot of issues. Perhaps he is the only prophet ( meaning explained by him) left on the planet. Noam Chomsky is without a doubt one of the most enlightened individual in this world and politicians and leaders the world over should all without exceptions study his writings and heed to his recomendations and the world would be a much better world, wars would cease to be waged and peace would come about. Nations could learn to live in peace and harmony with their neighbours and their populations would also live in much more happiness, justice and equality. Thank you Noam for your priceless work and wisdom and may you live many many more years in order to guide humanity to a better future.